It’s a potential watershed day for South Africa today. Yet another no confidence vote on our rotten president in Parliament, but this one has an edge on the previous versions in that it’s a secret ballot. And the opposition parties even had to go to court to get that ‘concession’. Albeit that the ANC has slowly been losing ground in our comparatively young democracy, it still holds a huge majority. So at least 20% of the ANC MPs must vote against Zuma in order for the motion to pass (assuming that all the opposition MPs also vote that way, which seems (mostly) likely). JZ and his people have worked hard – in various ways – to ensure that they are well supported within the party. There’s clear evidence of corruption and wrongdoing, but a lot of ANC MPs are involved in those nefarious acts, or they’re willing to overlook them, or they simply don’t care. Previously, anyone from the ANC sticking their anti-Zuma head up above the parapet has been swiftly dispatched, so the secret ballot is an important step. But then what personal reward is there for being on the right side of history if you’re voting anonymously? Will it be enough to succeed? Probably not, but I’m not sure that anyone actually has any idea. Apart from the fact that the vote might be quite close, there could be individuals who are saying one thing and doing the other – to the benefit of either side. It’s politics, hey? Here’s how a secret ballot happens in the RSA Parliament. And if it succeeds, what happens then? This. 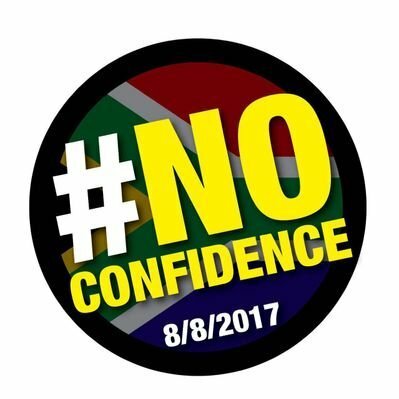 If a vote of no confidence is successful the President and the entire Cabinet will have to resign. The Speaker becomes acting president. The NA must (within 30 days) elect a new president from among its members. So Baleke Mbete as Acting President. Frying pans, fires. Personally, I think it will be a bigger blow for the opposition parties that they’d like to admit. This is definitely their best chance yet at removing JZ, and they seem to have high hopes. Of course, they’re going to talk up their chances, but when you put that public face on, you have to publicly accept the consequences if or when things don’t go your way. That said, every time there’s a no confidence vote in Zuma, it damages and fragments the ANC further, and so they will surely go again. The ongoing danger is that by next time, the ruling party has worked out which MPs voted against Zuma and has moved to… remind them of their party “obligations”, and realign them with the JZ faithful. There’s an air of expectation over Cape Town today. It feels like a big day. It feels like things could change. But no-one is willing to stick their neck out and call it just yet. Personally, I think that there’s no chance of the vote succeeding, but I’m just a humble bacterium wrangler and world famous blogger, not a political expert. And I really have no problem with being wrong on this one. None at all.